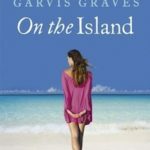 On the Island by Tracey Garvis Graves is one of my favorite standalone novels. 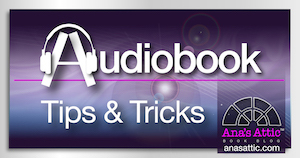 (See my review here). It’s been a year and a half since I read it, and it still ranks up there in my top recommendations. 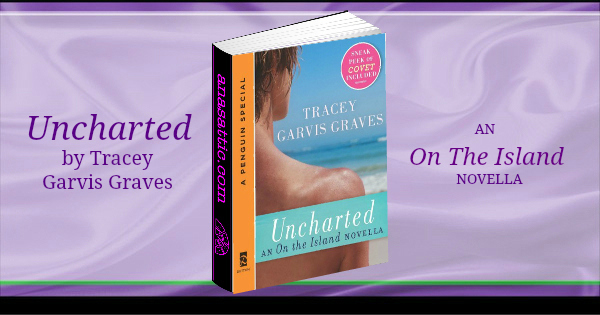 When I saw Uncharted: An On The Island Novella came out, I put off reading it. It’s been a while, I didn’t remember a lot of the details, and honestly, I thought the story was fine the way it was. It didn’t need anything else. But I finally gave into curiosity, when I remembered there were unanswered questions…there was a previous tenant of the island, and we will finally learn his story. Uncharted is it’s own story, but it does have spoilers for On The Island, so it doesn’t stand alone (On the Island does, but this is a nice companion). This is Owen’s story. Owen is “Bones” or at least who Anna and TJ thought was Bones, the guy who built a shack on the island and whose bones they thought they found. Uncharted opens up and BAM-I was sucked in, wanting to unravel the mystery of Owen, who shows up at Anna and TJ’s home a few years after their return wanting to share his guilt for their plight on the island. Owen was a 23 year old millionaire in the dot.com boom. He had enough of the people he thought were friends and family trying to mooch off him. Money changes people, and he didn’t like how he and the people he thought loved him had changed. So he takes off to a deserted island near Maldives. He has a friendly relationship with his pilot, Mick Forrester (yes, the same Mick who piloted TJ and Anna) who got him set up with a satellite phone and all the supplies he would need for a few weeks on the island. Mick comes back to check on him and bring him more supplies every few weeks, so it’s not the same at it was for Anna and TJ because he is there by choice and can leave anytime. But he doesn’t, he stays on the island, but makes the occasional trip back with Mick to the mainland. He tells his story about his life on the island (which lasted about a year) and about the house he built. 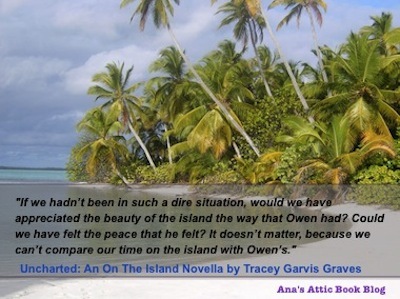 It was such a different experience from Anna and TJ’s because for him, this island was a beautiful haven. We got to know Mick and what a great guy he is. We caught up a little with Anna and TJ. But mostly, this was Owen’s story. On one of his rare trips to the mainland, he sees a beautiful girl, Calia. Realizing he is lonely and would love the company of a woman, Owen invites Calia to join him on the island. She brings her younger brother, and together they spend the summer there. There is a romance, there is heartbreak, and tragedy, and I loved every minute. Going back to the island and seeing it in a new light. Visiting with Anna and TJ. Having a completely fresh and new story. Answers to any lingering questions. It was a perfect companion book. I didn’t emotionally attach to the characters as much, as it was told in a more narrative tone. Tracey Garvis Graves has a magical way of telling a story. I don’t normally visualize things that clearly when I read, but I have such a clear visual of this island, and I’m so glad this story brought that vision right back to me. I highly recommend Uncharted for anyone who read On the Island, and if you haven’t picked up On the Island yet, what are you waiting for? I loved these two books so much! 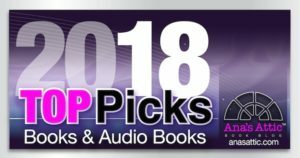 Great reads for anyone! I haven’t read this one yet but On The Island was one of my favorite books ever!! !